You can perfectly match or complement your roof colour and other building materials, and you can be confident of long lasting performance. Durable, exterior grade paint finish resists peeling, flaking and blistering in normal weather conditions. Gutters & downpipes are backed by a BlueScope Steel warranty of up to 20 years from the date of installation. This warranty only covers gutters & downpipes made from COLORBOND® steel. It does not apply to fascia made from COLORBOND® steel. The lightweight metal roof and wall cladding in an attractive range of modern profiles suitable for homes, industrial, commercial and rural buildings. 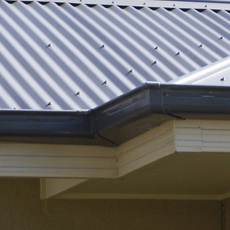 Bluescope steel guttering and Fascias conforms to AS 1397, AS 2179 and AS 2728, unless noted otherwise.